Scott Linton is convinced Greenock Morton won't have things their own way this weekend. Having already beaten Championship sides this season, Saturday’s Scottish Cup tie against Morton holds no fears for East Fife. Morton will go into the fixture as favourites, but would be mugs to take Darren Young’s side lightly. East Fife sit third in League One and have a good cup record this campaign. Linton said: “It’s going to be a difficult game against another full-time team, but we’ve already shown what we can do against full-time teams this season. Linton made his first start of the season against Montrose at the weekend. He’s had to wait patiently on the sidelines as manager Darren Young refused to tinker too much with a winning side. 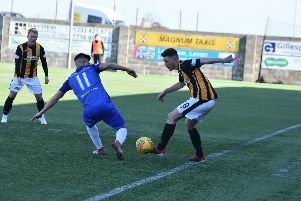 But he grabbed his opportunity on Saturday, playing a crucial part in the midfield as East Fife returned to the Kingdom with all three points. “We had to battle better than we did against them at Bayview,” said Linton. “We did that and I thought we were excellent. “Montrose are great from set-pieces and have a game plan they’re good at and will put any team under pressure. Linton admitted he could have no complaints about having to bide his time for minutes while the side has been playing so well. “It was just about taking my chance when it came,” said the midfielder. The former Clyde man was played in a more advanced role at the weekend - and it was one he enjoyed. “I’ve spoken to the manager and the assistant and they said they see me playing further up the park,” he said.